Welcome to the TSWAA Internet site! 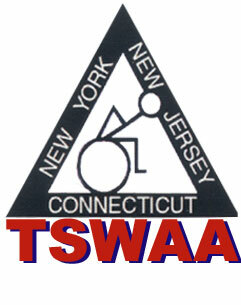 promote disabled sports in the New York, New Jersey and Connecticut area. Links to disabled Sites to help find information, products and services. If you would like to volunteer your time. Tell us and we will get you involved. Become a member of Adaptive Sports USA (ASUSA) - Click here and sign up! 4/27 at County of Morris NJ Community College. 08_07_18 - After many years Tri-State and the Kessler Foundation has end the Grand Prix road race program. has achieved its goal to get Para athletes to do more road racing and is no longer needed. over the program's 10 years good racing going forward. click on "ASK TO JOIN". the Lightning Wheels - Download Yours. Wheelchair and all Physically Disabled sporting events.